Shutter of Digital Camera is a light-proof,mechanically movable element in a camera which controls the during of exposure time to make the image sensor exposed. Film cameras used rotating shutter for the same function. 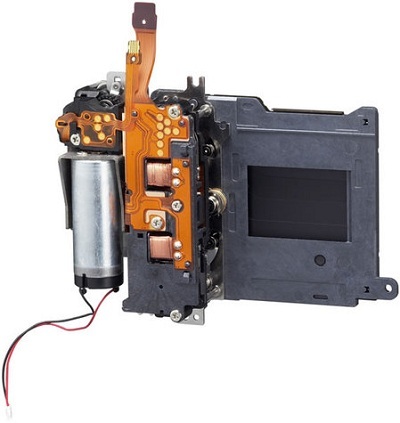 In Digital cameras, the shutter mechanism is implemented electronically. Shutter is immediately situated behind the lens and actually were used in some old film cameras. Shutters in front of the lens is not in use now and were used in the early days of photography. Central locking Shutter has flexible curved blades which open radially for the time duration of exposure. The central locking is usually located between the front and the rear lens group. There are various other Shutter mechanisms like Diaphragm shutter, rotary disc shutters etc. The control of slow shutter speeds with remote trigger or cable release can be found under the name B (ulb), T (ime), M (oment) trigger for regular exposure time. Mechanically controlled shutter speeds are usually are focal plane shutter which opens up to 1/1.000 second, central locking shutter on the other hand gives up to 1/500 second. The shortest purely mechanical shutter speed is 1/4000th seconds. Shutter lag is the time between pressing the shutter and the response of the camera to open the aperture. In old days this lag had an importance, but now this shutter lag has least importance in DSLR cameras. Shutter cycle is the whole process of pressing the shutter, opening up of the aperture and then coming back to neutral position again. The life expectancy of a mechanical shutter, which is the number of shutter cycles it has undergone. In case of most digital SLR camera, there is a lifetime of the shutter system which can be approximately calculated from using various softwares. The importance is that, after a typical number of firing, the shutter mechanism starts to malfunction and this is an worthy point to check while buying an old DSLR camera. This Article Has Been Shared 1284 Times! Color balance in Digital Photography is used for determining color temperature of light for determining intensities of colors. Also known as White Balance. Blur in Digital Photography has been a separate niche now due to the advantage of a Digital Camera to have the preview, instant view and due to the softwares. How to Insert Signature in Digital Photography for several purposes like promotional purpose, to declare author’s name, declare the copyright etc. Cite this article as: Abhishek Ghosh, "Shutter of Digital Camera," in The Customize Windows, July 12, 2012, April 24, 2019, https://thecustomizewindows.com/2012/07/shutter-of-digital-camera/.